We welcome all cardiology cases from straight forward heart murmur examinations to complex congenital abnormalities. Referred animals (mainly dogs and cats) will be seen promptly. We will always take the time to understand and discuss the pet’s problem and explain what investigations we feel are required and why. We take time to clearly explain the underlying diagnosis and how we can help. Results will be discussed by telephone and reports are written to the referring vet within 24 hours of consultation. Consultations in cardiac and respiratory medicine for investigation of problems such as heart murmur, arrhythmia, collapse, syncope, seizures, cough, ascites, cyanosis, reduced exercise ability and breathing abnormalities. Full assessment of all acquired and congenital heart conditions. Full echocardiography service using state of the art equipment, offering high quality 2D, colour, spectral and tissue Doppler. ECG recording and interpretation, with ambulatory monitoring service (Holter) for up to 72h, and event loop recorder implantation. These tests are extremely useful for animals with collapse or syncopal episodes, and to assess the effect of anti-arrhythmic therapy. Direct digital thoracic radiography allowing us to quickly achieve high quality thoracic radiographs. High-definition oscillometry (HDO) blood pressure analysis. Telephone or e-mail advice on material submitted for interpretation. Readily available interventional cardiac procedures including pacemaker implantation (and in-house pacemaker interrogation), balloon dilatation of obstructive defects such as valvular pulmonic stenosis, PDA occlusion with coil or Amplatz devices, coil-stenting of intra-hepatic liver shunts and diagnostic angiography. Superb hospital facilities with multi-disciplinary service, allowing us to offer a comprehensive opinion in more complex cases, separate cat and dog services, 24-hour nursing care of hospitalised patients, in-house CT and MRI and 24-7 emergency cover. 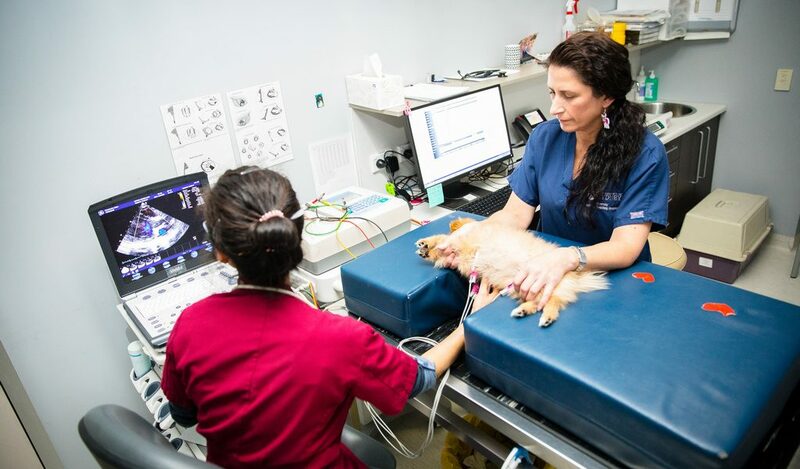 The Cardiology Service is also engaged in clinical research programs such as genetics of mitral valve disease in dogs, novel heart failure medications for dogs and cats and cardiac CT-imaging in animals with congenital heart disease.